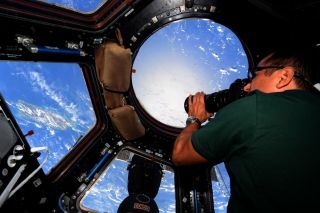 NASA astronaut Joe Acaba takes pictures of Earth from the International Space Station's 360-degree Cupola window. Update for Oct. 26: NASA has created an interactive photo map with all of the #1world1orbit photos shared on social media. As the International Space Station completed one orbit around the Earth this morning (Oct. 23), people all over the planet beamed photos of their ground-based views up to the orbiting laboratory. NASA astronaut Randy Bresnik, who is currently at the space station, requested on social media that the people of Earth help him "capture a moment in time" by taking photos of Earth from below while he took his own photos from above. A map of the International Space Station's path around the world for exactly one orbit on the morning of Oct. 23, 2017. "Our inspiration for this evolved from an activity in the 80s called 'A day in the life of America,' where 200 of the world's leading photojournalists set out across America to capture the life of a nation on film in a single day," Bresnik wrote in a Facebook post. "After the event, over the days and weeks to come, we will post imagery our crew captured of that moment in time." The astronauts started their "photo frenzy" at 8:25 a.m. EDT (1225 GMT) as the space station began to pass over the United Kingdom, where one Twitter user shared a photo of London's cloud-covered "Shard" building, a pointy skyscraper by the Thames River. Elsewhere in Europe, people shared photos of clear skies and sunlit cityscapes, like in the Netherlands and Germany. It took the space station about 20 minutes to cross over all of Europe before it made its way over the Middle East, and Bresnik called for photos from Africa. In the East African country of Tanzania, one Twitter user shared a photo of a herd of zebras grazing on a grassy plain. Another person shared a photo of the sun setting in Cape Town, South Africa, near the famous flat-topped Table Mountain. At 8:57 a.m. EDT (1257 GMT), as the space station passed over the Indian Ocean, Bresnik called for the people of Asia to share their photos. One person tweeted a photo of city lights in Lebanon just before sunset. Another Twitter user shared a photo of the evening scene in Kolkata, India, where boats float in the Ganges River near a bridge called Vidyasagar Setu, which connects the cities of Kolkata and Howrah. By the time the space station made it to Australia, it was already nighttime down under. But that didn't stop some night owls from tweeting their views from the dark. In Sydney, one user shared a wide shot of the cityscape by night. Meanwhile, in Perth, another Twitter user shared a photo of a (fake) kangaroo in front of the city council building. After leaving Australia, the space station spent about 30 minutes crossing the Pacific Ocean before passing over the Americas, where people were just starting off the day. Bresnik first called for South Americans to share their photos on social media, tweeting his summons at 9:41 a.m. EDT (1341 GMT). One user from Buenos Aires, Argentina, tweeted a view of the city's congressional plaza in what appears to be the start of a beautiful day. Last but not least, Bresnik called for photos from North America. The space station passed directly over Houston, home of NASA's Johnson Space Center (JSC), at 9:56 a.m. EDT (1356 GMT). Patiently awaiting the overhead passage of its orbiting laboratory, JSC tweeted photos of the center's campus about 30 minutes before the station flew by. Canadian astronaut Joshua Kutryk, who also happened to be in Houston, tweeted a photo of a line of NASA jets sitting on the tarmacat sunrise. Meanwhile, in Saskatchewan, Canada, another Twitter user shared a photo of a beautiful nature landscape. At 10:05 a.m. EDT (1435 GMT), the space station completed this orbit around the Earth, and Bresnik and Acaba finished their 90-minute Earth photography session. Their photos from space will be posted in the coming days. So stay tuned to Space.com — and Bresnik's Twitter account, @AstroKomrade — to see the astronauts' views from space.